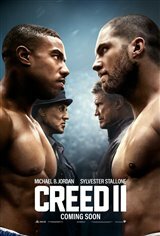 Adonis Creed (Michael B. Jordan) is up against the challenge of his life. In 1985, he lost his father, Apollo Creed, who was killed by Russian boxer Ivan Drago during a boxing match that ended tragically. Against the wishes of his trainer Rocky Balboa (Sylvester Stallone), Adonis accepts a challenge from Drago's son Viktor (Florian Munteanu), who's also a boxer. With Rocky's help, Adonis now has to train for the showdown of his life — which soon becomes his obsession. Now, Creed and Balboa must confront their shared legacy, question what's worth fighting for, and discover that nothing's more important than family.